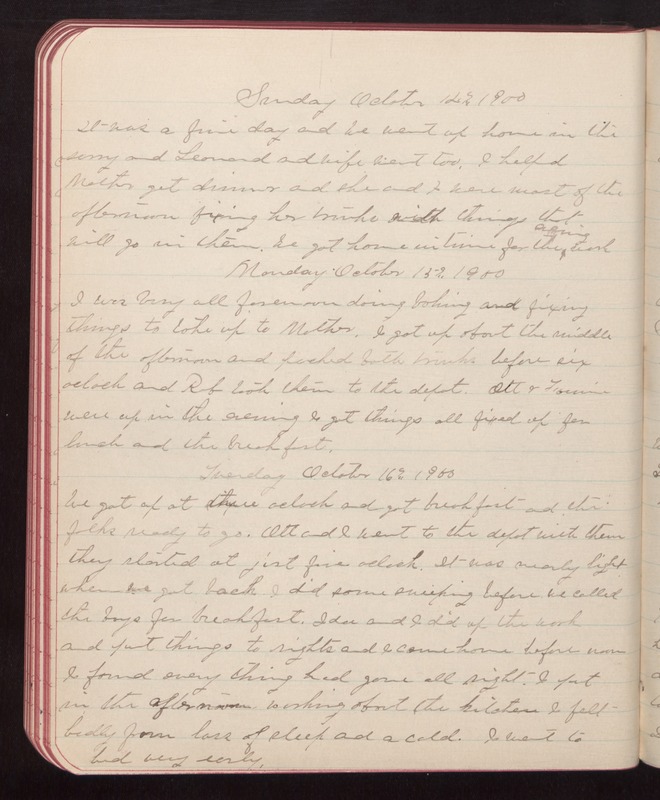 Sunday October 14th 1900 It was a fine day and we went up home in the surry and Leonard and wife went too. I helped Mother get dinner and she and I were most of the afternoon fixing her trunks with things that will go in them. We got home in time for the evening work. Monday October 15th 1900 I was busy all forenoon doing baking and fixing things to take up to Mother. I got up about the middle of the afternoon and packed both trunks before six oclock and Rob took them to the depot. Ott & Fannie were up in the evening I got things all fixed up for lunch and the breakfast. Tuesday October 16th 1900 We got up at three oclock and got breakfast and the folks ready to go. Ott and I went to the depot with them they started at just five oclock. It was nearly light when we got back. I did some sweeping before we called the boys for breakfast. Ida and I did up the work and put things to rights and I came home before noon I found everything had gone all right. I put in the afternoon working about the kitchen I felt badly from loss of sleep and a cold. I went to bed very early.